Last time I presented the case for canonical time evolution stemming from the non-commutativity of operator algebras, and today I'll start talking about the reverse implication: obtaining quantum mechanics from the existence of time. (v) the matrices P and Q form an irreducible system, i.e. the only matrices A satisfying [X,P] = 0 = [X,Q] are of the form \(X = \lambda I\) where \(\lambda \in C\) and I is the unit matrix?" It turns out that the Dirac problem has no solution and the proof is actually not very complicated. What are really complicated are the solutions to the quantization problem, and different approaches reject different assumptions in Dirac's problem. 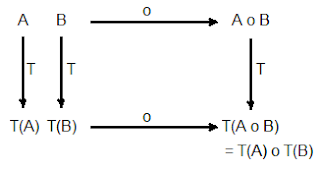 T(A) o T(B) = T(A o B) which shows that [T, o] = 0 (T after o is the same as o after T) or that time translation preserves algebraic relations. Now the heavy mathematical lifting follows using category theory arguments (invariance under composition = universality of the theory) to completely recover the algebraic structure of quantum and classical mechanics. Then using geometric or deformation quantization (to avoid the lack of the solutions for Dirac's problem) one obtains the usual Hilbert space formalism for quantum mechanics. Therefore the Poisson bracket and commutator are the only mathematical realizations of Leibniz identity for theories of nature obeying invariance under composition. 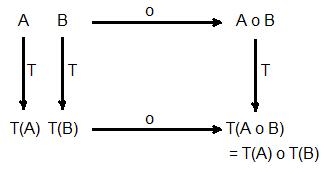 The starting point of quantum mechanics reconstruction using category theory arguments is Leibniz identity and this follows from infinitesimal time translations of the commutative diagram from above. collapse postulate -> unitarity violation -> violation of Leibniz identity -> no Hilbert space formalism for quantum mechanics!!! It makes no more sense to talk about Hilbert space, operators, etc and this is clearly impossible. Something must give. Is it that there is no real collapse (MWI)? Or do we need to add contextual protection (Bohmian, QBism)? Or maybe there is an extension of quantum mechanics (GRW)?